"A wonderful appetizer to have on hand that can be made ahead of time, frozen, and used as needed." Trim crusts from bread, and flatten slightly with a rolling pin. In a bowl, stir blue and cream cheeses together with the egg until well blended and creamy. Spread a thin layer of cheese mixture over each slice of bread. Roll one asparagus spear inside each, and fasten with a toothpick. Melt butter in a small saucepan. Roll each asparagus wrap in butter to coat. Place on a baking sheet small enough to fit into the freezer, and freeze for one hour, or until butter hardens and wraps are somewhat firm. Remove pan from freezer, discard toothpicks, and cut each wrap in half crosswise. Store in a resealable plastic bag in the freezer until ready to use. To serve, preheat oven to 400 degrees F (205 degrees C). Arrange frozen asparagus wraps on an ungreased baking sheet. Bake in the preheated oven for 25 minutes, or until lightly browned. Check occasionally, and turn if necessary, for even browning and to prevent burning. Enjoy! 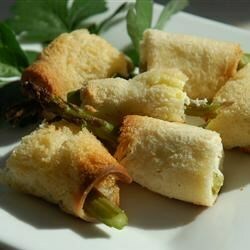 It's a wonderful appetizer that will satisfy all your asparagus & blue cheese fans! Quite easy as well.